If it wasn’t so darn expensive, Nice would be an almost perfect location in terms of the kind of place you’d want to live. You’ve got all the hustle and bustle (and amenities) of a city, a beautiful pebble beach (and many sand beaches within walking distance), sunshine weather, and a little bit of culture thrown into the mix with a few nice art galleries to visit. It’s no wonder the likes of Picasso chose to base himself here for a little while during his life. It has pretty much everything you could ever need for a place to live. Nice has such a perfect location to get to anywhere. For a start, the main airport is only a 15 minute bus ride from the city centre and serves the rest of Cote d’Azur, including places such as Monaco, Antibes, and Cannes. It’s also only around 20 minutes drive from Nice to the Italian border. You can’t really beat Nice if you want a location to explore in Cote d’Azur. 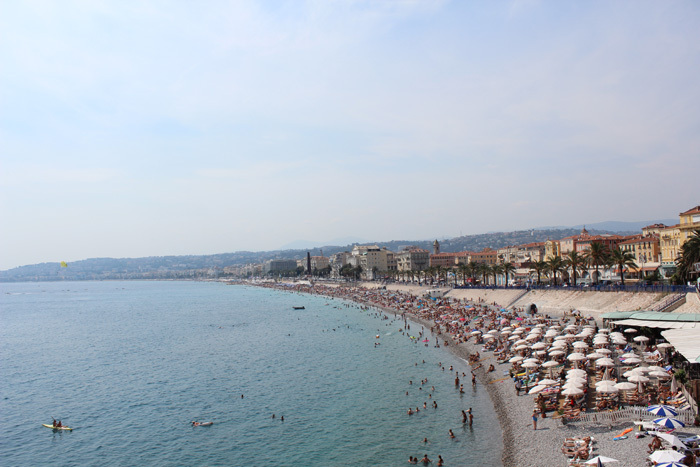 Nice is a big water sports location with it’s close proximity to the beach. You can also go canyoning about 45 minutes drive inland, which was another cool added extra the St Exupery Hostels can organise for you. Overall I just found Nice to be a really cool city, and definitely ‘my cup of tea’ when it comes to locations. For a budget traveller it may be hard to visit this destination and not spend a fortune, but you will find that everywhere in France – not just here. I definitely think it’s worth at least 2 days of your time, and if you’re not on a total shoe-string budget I’d stay longer and just chill by the beach… Just watch out for the pick-pockets while you’re there. Mr Kash-Money at the BudgetTraveller.org got his passport stolen while he was there! – If you enjoyed this article you may also be interested in reading my first impressions of Frankfurt. You may also be interested in some French holiday apartments. I loved Nice when I was there. You’re right about it being expensive but it’s definitely worth a visit! I spent 5 weeks in Nice learning french a few years back and loved it. I thought the city center was very charming… and even though you don’t have a sand beach in the city itself, there are many beautiful beaches a few minutes drive away! Funny how foreigners love Nice when we, french people, don’t so much. I wouldn’t have chosent that city to represent what France is about outside of Paris but it’s great to have another point of view. I’ll be able to send my non-french friends to your website so they can have a more objective insight! Thanks! Great job on the blog by the way! I’m a new reader but definitely find it very attractive.